Maximum size: about 65 mm. Identification: The notum of this pleurobranchid is covered with closely spaced conical tubercles. A few scattered tubercles are noticeably larger than the others and the background color ranges from light orange to dark wine-red. The amount of white pigment is highly variable with many animals lacking it entirely and some being almost completely white. (Note 1) In those with only scattered white spots, the white pigment is concentrated on the dorsal faces of the larger tubercles creating the illusion that they are longer than they appear to be in dark individuals. In young animals, the tubercles are poorly developed and the rhinophores have white tips.The smaller tubercles and lack of contrasting dark tubercles distinguish it from Pleurobranchus cf. peronii. Natural history: Pleurobranchus varians is a common nocturnal species found in moderately protected to highly exposed rocky habitats and, occasionally, in Halimeda kanaloana beds. It occurs in tide pools and subtidally to depths of 15 m (50 ft). Like many pleurobranchs, it may autotomize portions of its mantle if disturbed. It contracts it's rhinophores rhythmically while crawling and lays a cream egg mass with a ruffled upper margin that hatches in about four days in the laboratory. Distribution: Big Island, Maui, Oahu, Kauai and French Frigate Shoals: also reported from Vanuatu and the Philippines. Taxonomic notes: Goodheart, et. al. (2015) separates this species from Pleurobranchus albiguttatus (Bergh, 1905). The photograph labeled Pleurobranchus peronii in Kay, 1979 is of the dark form of this species, instead (as is the photo in Kay & Schoenberg-Dole, 1991). Although Kay, (1979) suggests that it is unidentifiable and Goodheart, et. al. 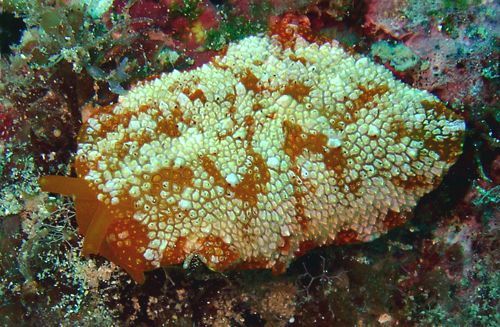 (2015) suggests that it's an indeterminate Berthella sp., it seems possible that Pleurobranchus marginatus Pease, 1860 is actually a small juvenile of P. varians. Photo: PF: light: Makena, Maui: July 6, 2008. Note 1: We've seen dark and white-spotted animals paired under rocks on several occasions. (see photo) Also, both color forms have identical flattened, wedge-shaped shells. Those observations support placing them in the same species. However, the ratios between the color forms vary greatly from site to site (and from year to year at a given site) suggesting that diet or some other environmental factor may play a role in determining the pattern.